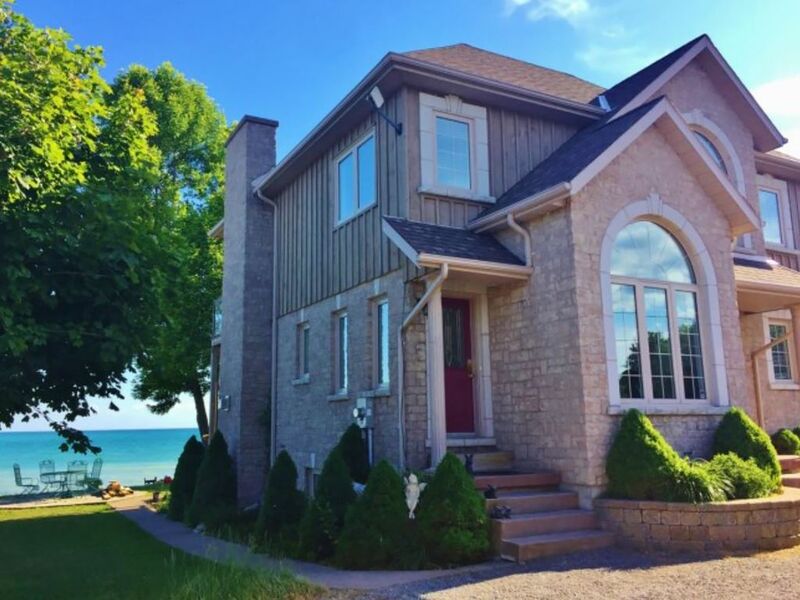 Beautiful lakefront house located right on the shores of Lake Ontario, only 1 hour and 20 min of Toronto. It has a shoreline that offers crystal clear and shallow water. It offers a peaceful and relaxing atmosphere in a renovated luxurious home with private patios to enjoy the beautiful waterfront views. The specious lot has a swimming pool (not heated) and a shaded patio with a barbecue, we can imagine many evenings spent outside listening to the waves lapping at the shore. Refresh in our private pool that looks across the lake or stroll the beach or walk or bike to nearby nature trails to participate in bird watching or hiking. Explore the magical country side that surrounds us! This is a terrific location for being as active or relaxed as you want. With plenty to see and do in the area - Presquile Provincial Park within a short distance, and popular Sandbanks beaches a 40 minute drive - as well as the picturesque towns of Brighton, Cobourg and Port Hope close by, you won't be short of things to do. The house has all new modern comfortable furniture and mattresses. The interior is light and airy with large windows giving spectacular views of the lake. Entrance leads into a living area with sliding doors to the deck and an open-plan living and dining area. The kitchen is comprehensively equipped and has a full size fridge and dishwasher. Dining area has a large table for 6 -8 guests. Sitting area has relaxing reclining sofas and a fireplace. There is a 1/2 bathroom on the main floor as well. On the second floor we have 3 bedrooms, all with a lake view. Master bedroom has a king size bed, 4pc bathroom and a balcony. Second bedroom has a queen size bed and a balcony. Third bedroom has a queen size bed. The 3pc bathroom is shared between 2 bedrooms. The lower level of the house – is a big open space with its own kitchen, 3pc bathroom and walkout to the lower patio. It has a big sitting area with 55 TV, dining area, queen bed and comfortable sofa bed. It will be enough room for the whole family or group of 4. Our waterfront cottage offers the comfort you have been looking for! NOT PROVIDED: beach towels, kitchen towels and all the paper products except the toilet paper and cleanse (paper towels, napkins etc). We enjoyed our 2 nights at this property. It is in a lovely area of Ontario and close enough to Cobourg where I have family. Beautiful house and helpful owners. The only thing I would suggest is having someone to clear the ice away on the sidewalk before guests arrive. And leaving a snow shovel and ice pick out for guests in case there is a need to use during the stay. Thank you Marina. La vue sur le lac est omni présente. Maison très confortable, propre dans un secteur calme en bordure du lac. Marina est disponible et répond rapidement à nos questions. Nous souhaitons tous y retourner. I chose this location to bring my sister out for a relaxing week to getaway from it all. This beautiful home was the perfect place. The house was clean and had all the amenities required to feel pampered. The back faces the lake, and you have views of it from almost every window. The owner was very quick to respond to any question I had regarding the place, and very friendly. We hated to leave. This place was perfect for a recent vacation with 6 adults and 2 kids. The 3 full bedrooms, full bathrooms, and expansive separate basement living area provides so many different spaces for all different types of guests. There are two kitchens which accommodated our desires to save on eating out. There are grocery stores, pharmacies, and anything else yet you need just a short scenic drive away. The exterior spaces are beautiful, with views of the lake that will stop you in your tracks. Whether down by the water in Adirondack chairs, Dining by the grill, or enjoying a bit more shade on the newer patio furniture, it was easy to be comfortable outside and feel the nice breeze off the lake. The pool is easy to use, we didn’t use it much since the temps were a little cooler. Our group went from small kids to grandparents, and everybody loved their time at this house. Marina was super responsive both leading up to and through our stay. We would definitely return.